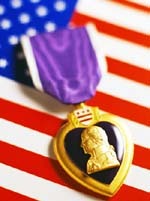 A 501 (c) 3 foundation formed to support the families of our military. Through the modem of aerospace education we open the doors of opportunity. 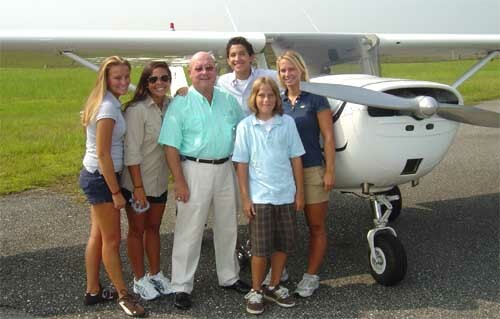 Teens-In-Flight provides flight training and aviation maintenance scholarships to those teens who have lost a parent or sibling in the Global War On Terrorism or, is the teen or sibling of a parent who was wounded in action and is disabled. Another phase of our program also focuses on selected teens that are considered "at risk" within our community by providing a positive aviation intervention experience. TEENS-IN-FLIGHT IS PROUD TO ANNOUNCE OUR PLANS FOR EXPANSION THROUGHOUT THE NATION. OUR EXPANSION IS DIRECTED TO, AND AROUND, MILITARY INSTALLATIONS TO BETTER SERVE THE CHILDREN OF THE SERVICE MEMBERS WHO HAVE LOST THEIR LIFE IN THE WAR ON TERROR IN IRAQ AND AFGHANISTAN. TEENS-IN-FLIGHT ANTICIPATES OUR PROGRAMS AT FORT BRAGG, NC, CAMP LEJUNE, NC, FORT HOOD, TX AND FORT BLISS, TX THIS YEAR. PROGRAM EXPANSION COULD NOT BE POSSIBLE WITHOUT OUR BENEFACTORS, THE FAA, AND THE STEPHEN M. PRICE FOUNDATION . THIS IS OUR EFFORT TO HELP THESE FAMILIES BEGIN THE HEALING PROCESS AND TO SHOW OUR APPRECIATION TO OUR ARMED FORCES MEMBERS WHO HAVE SACRIFICED ALL FOR OUR FREEDOM. TEENS-IN-FLIGHT ALSO HAS FLIGHT ORIENTATION PROGRAMS FOR THOSE TEENS OF FALLEN WARRIORS WITH SPECIAL NEEDS. Teens-In-Flight is proud to announce our partnership with King Schools, America's premier producer of aviation training videos and computer software. They are the best of the best! Teens-In-Flight Announces Partnership with Children of Fallen Patriots Foundation. Click here for details. RIBBON CUTTING FOR NEW OFFICES AND CLASSROOMS. 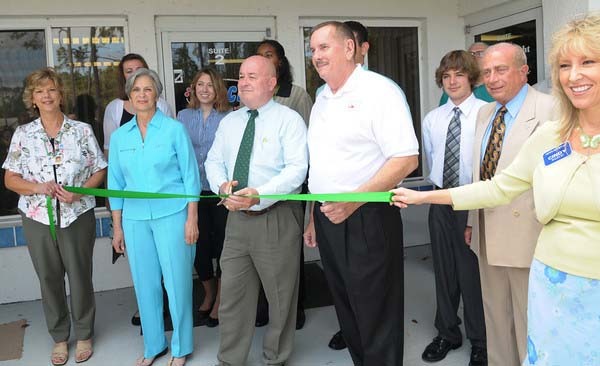 Directors Samantha Howell, Jack Howell, and Stephen Price cut the ribbon and dedicate the new facilities in Palm Coast while surrounded by supporters, friends and some of our flight students. Jonnathan Jenkins gets the traditional shirt tail cut. The cutting ceremony was conducted by Palm Coast Chief Flight Instructor Josh Jackson. NEWEST MEMBER OF OUR FLEET. 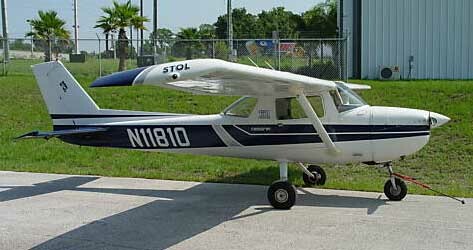 Teens-In-Flight is proud to announce the addition of Cessna 150 N11810 to our fleet of training aircraft. Dakota May and his dad. Dakota had just finished a 2 hour flight lesson. Sgt May was seriously Wounded In Action in Iraq and Dakota is getting his wings through Teens-in-Flight. Priorities for our selection processes for awarding flight training scholarships. 1000 word essay on "Why I want to Fly"
Our Flight Training School is staffed by "the best of the best". 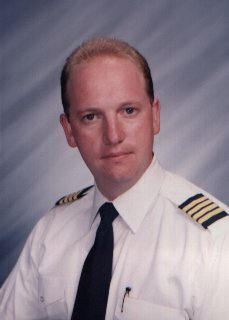 Joel D. Weaner, Director of Flight Training, is a Master CFI and FAA Aviation Counselor. Lisa Korosi is an AGI and was an airline captain with many flight hours. They oversee our instructors to insure the highest standards of aviation training are met. Now Accepting Applications for Palm Coast Florida And Fort Benning/Columbus Georgia Flight Training. TEENS-IN-FLIGHT program expansion is working in the following cities. If you would like to help us, please don't hesitate to e-mail or phone us.